Our team is in Soddo Ethiopia to initiated a program for mass screening of young people for early signs of rheumatic heart disease. As we have mentioned before, if it is found early, the progression can be stopped with monthly penicillin shots. We had our first practice screening this past Saturday. 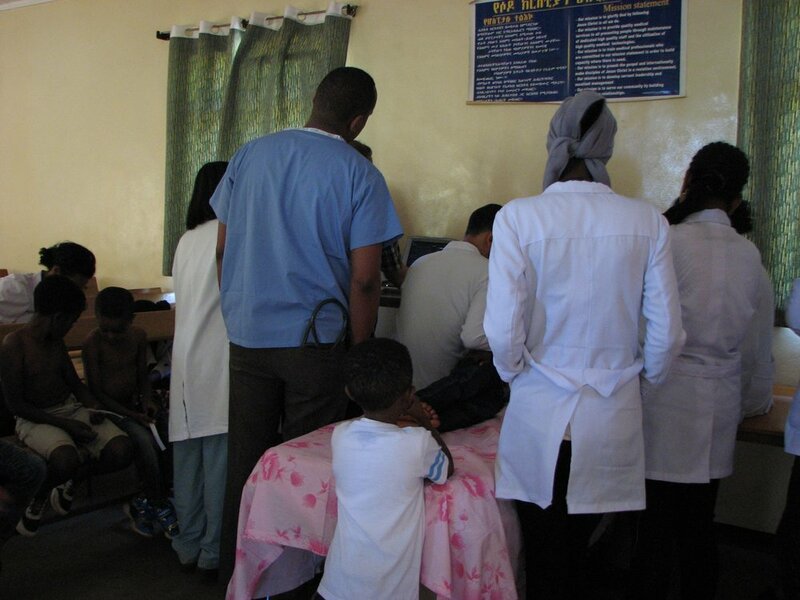 Dr. Michelle Yates (in blue) invited the hospital staff to bring their children to be screened. The trainees took turns doing the ECHO and all looking and interpreting the results. We scanned about 80 kids and found 6 positives. That's 6 kids who can now go on penicillin and not suffer the debilitating effects of rheumatic heart disease. We had planned to be doing Mitral balloon procedures (for explanation see blog December 26 2015 fixing hearts in Africa) in Kenya this trip, but were told that some of the essential equipment had broken down. We were saddened to hear this knowing we had a number of patients waiting to have valves fixed. 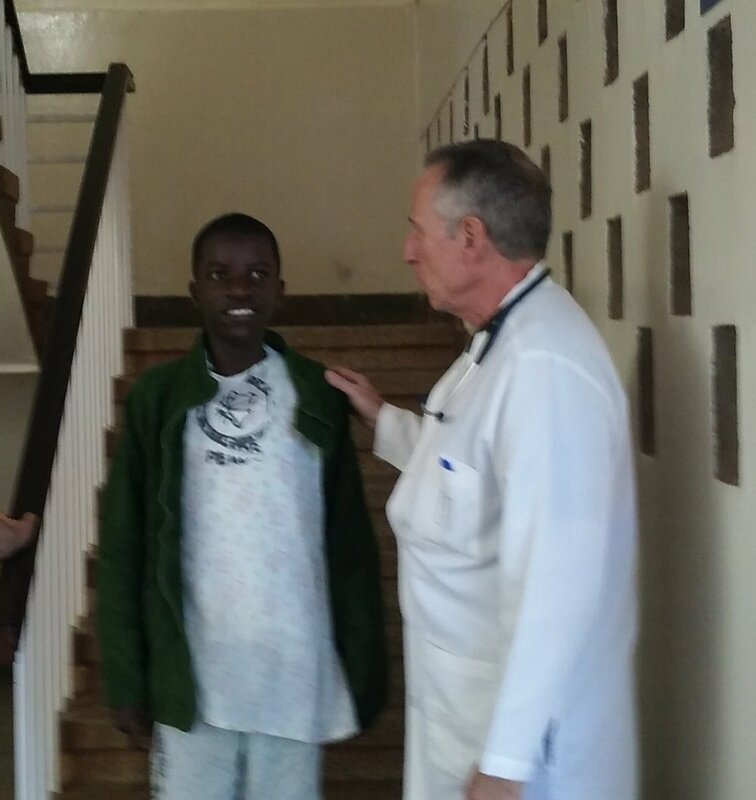 Once we arrived we began screening more patients to determine which ones would be good candidates for the Mitral balloon valvuloplasty on our next trip in April. We found a few kids with early signs of rheumatic heart disease who can be put on monthly penicillin to prevent further disease and were able to do followup examinations on some of our past patients. It was amazing how well they are doing, beyond our hopes and expectations. in 2015 we arrived with our small team to screen and start treating patients with damaged heart valves from rheumatic heart disease. Of the approximately 100 patients, some were medically managed, some referred for more extensive surgery, some were put on the list for future mitral balloon procedures and 9 were scheduled for the procedure. Moses was our first patient. He's was 14 year old at the time with a badly damaged mitral valve making it difficult to even walk short distances. The procedure was so successful that he was even able to climb stairs the next day. From Bomet we traveled to Eldoret to meet with the cardiac team at Moi Teaching and Referral Hospital. They are in the process of preparing to do invasive procedures and would love to learn Mitral Balloon Valvuloplasty. We are excited to begin teaching the procedure and passing on what we have learned. There was also interest in our rheumatic heart disease screening program (see blog December 26 2015 screening) which we were happy to hear. The only way to make a significant difference in the number of young people dying of this horrible disease to to find them early and begin treatment to stop the progression of the disease. Many of you may remember Etienne. When we first met him, he was being held at the hospital because his family was not able to pay the bill. He is the little boy in Cameroon who suffered sever burns to his feet leading to the amputation of his right leg below the knee and the most of his left foot. The burns happened under "mysterious circumstances". Where most of us would have been angry and bitter, He is a happy, loving and outgoing child with an infectious smile. With some help, he was able to be discharged from the hospital and is practicing getting around with crutches. It is a real challenge on the bumpy dirt paths. He is currently looking at the possibility of more surgery and a long process of rehabilitation. The goal would be for for him to be able to get fitted for a prosthesis. Mbingo hospital, not too far from him, has an extensive physical therapy department where they also do prosthetics.